Car2Go Is Trading Smart Cars for Mercedes, Among Other Changes. How Will Denver’s Streets Change? 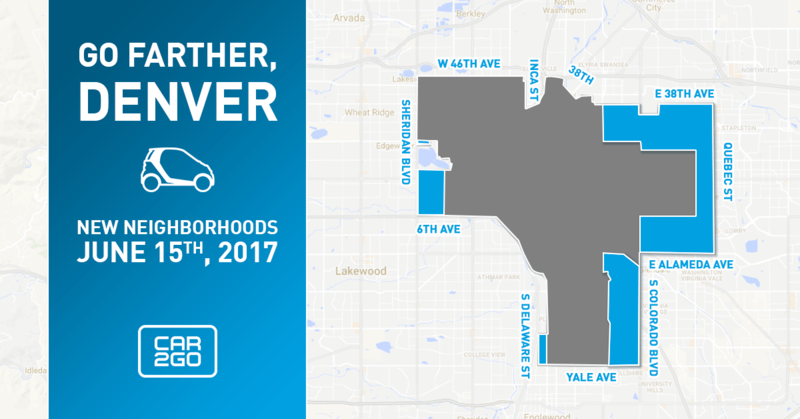 Car2Go is Denver’s largest car-share service, with 330 cars and more than 42,000 members. So when the car-share company makes changes to its service model, it can have all sorts of effects on Denver’s streets and how people choose to get around. Yesterday the company began phasing out its two-seater, parking-nimble Smart cars in favor of two Mercedes-Benz models, a sedan and an SUV. Members will pay 13 cents more per mile for the luxury of five seats and all-wheel drive — a 40 percent increase. Eventually, the Mercedes cars will comprise Denver’s entire Car2Go fleet. It’s a business move that the company claims caters more to Denver’s mountain-loving, Red Rocks-rolling lifestyle. Mercedes-Benz…really?! I liked how little space the smart cars used and will be less likely to hop in a Benz to scoot across town. Not everyone is buying it, though. From a public policy standpoint, car-sharing should be a tool that helps residents forgo car ownership. Will the changes help or hurt? Members seem more excited about Car2Go expanding its service area. The company added West Colfax, Hilltop, Belcaro, Clayton, and previously uncovered parts of Park Hill to the mix. Montclair, Wellshire, and Washington Park were reinstated, after the company nixed them from the map in 2015. A lot of people dig the Smart cars because they’re tiny and can fit into small parking spots. There’s no denying that some of those on-street spaces won’t constitute parking spots for the new, bulkier cars. But Joespeh Skelton, general manager of Car2Go Denver, said the two-seaters hindered customers. Now the car-shares can function more as carpools, which will take cars off the road, he said. Anthony Avery, a local transportation planner and Car2Go member, said he liked the four-door option, because he’s most likely to use the service when guests are in town. But he doesn’t understand why Car2Go wouldn’t keep both vehicles for both segments of the market. Asked why the company doesn’t provide both options, Skelton said the Car2Go fleet is old, and Mercedes are simply nicer cars. In Austin, which is a similar market to Denver, “the members love it, they use it, they search them out because it’s more like their car,” he said. Maybe not to own, but with more than 42,000 members, the company seemed to be doing okay with the smaller vehicle in the Denver fleet. And they’re 40 percent less expensive than the luxury vehicles. We know more than we used to about the effects of car-share services on cities. A University of California Berkeley study found that each Car2Go vehicle removed between one and 11 personal vehicles from the streets, depending on the city (the study looked at San Diego, Calgary, Seattle, Vancouver, and DC). These figures combine every car-share company in Denver. Car2Go is a private company with proprietary information, and doesn’t share it with the city because it doesn’t have to. So while we don’t know exactly how much these numbers represent Car2Go’s impact, it’s safe to say it’s significant given the company’s market share here. It’ll be interesting to see if and how these numbers change. Skelton said the company would consider changing its model again, based on member feedback. Terrible news. As someone who’s been living in Denver without a car, this removes a service I rely on and replaces it simply another version of “mountain car share”. Honestly, no thanks. Turo rents for half the price for a full day with the same mileage, and more flexibility in terms of make/model and pickup/dropoff times. Plus, there’s a guaranteed spot to leave it when I return. I’d be embarrassed to be seen driving one of the these yachts around town. Instead of making car sharing more affordable and broadly appealing, this move makes it a privilege for the few. Bigger margins, fewer users, and a company that’s selling it’s soul.